Cybersecurity risk will certainly grow in 2018, warns Christopher Skinner, CEO of technology security firm SpiderOak. “We trust our devices and systems to drive our cars, deliver vital medical treatments, and protect our homes and supply chains, but these have never been more insecure,” he says. Software updates: The new Trojan horse. How do you know the latest software update isn’t a virus? Criminals are using normal update processes to infect computers. “This is the kind of breach that destroys trust between users and software providers,” says Skinner. Spies may be on your phone. “Gaining access to your phone essentially puts its functionality in the hands of a remote user, who can geolocate you, take pictures of where you are, eavesdrop on your conversations, and gain access to personal information that can be used to intimidate you,” says Skinner. Criminals will wait to attack. “One of the most frightening things about the breaches at Equifax, Target, and elsewhere is what we haven’t seen yet,” warns Skinner. Once criminals have stolen the data they need, such as Social Security numbers, birth dates, and other personal details, and they may hold onto the data for years until people let their guard down. “Your data can just be sitting out there on the dark web, waiting to be sold or used, well after you think you’re safe,” Skinner says. Passwords are failing. “The most common password last year was ‘123456’—that’s a problem,” Skinner says. “Human nature wants to simplify, so we use weak passwords and the same password for multiple sites.” He recommends using the “one-two punch” of authentication and encryption to secure data. Light fixtures can be a magnet for dust and dead bugs. Spritz and wipe them with a cleaning solution to get them shining again. Dougherty recommends washing the porcelain thrones all over. Start with the top of the tank and spray all around—the lid, under the lid, the seat, the surrounding floor, and the walls behind the toilet, Dougherty recommends. Use a handy vac or spray a rag with vinegar and wipe away any dirt or crumbs that have accumulated in drawers throughout the home. Clean and sanitize the entire system periodically. Old ice can absorb food odors, Dougherty says. Pull out the ice bin, dump the ice, and wash the bin and ice maker with vinegar, Dougherty recommends. Be sure to wipe the ice maker with a dry rag to get rid of any remaining moisture before putting it back in place. Read about the other forgotten cleaning spots and how to clean them at HouseLogic. If you’re about to embark on the home-buying process, you want to know how to buy a house the quick and smart way. The process typically takes two to three months, but in a seller’s market with low inventory and strong buyer demand, it could take six months to a year—or longer. But what if you could cut that time in half, without having to make any sacrifices? You’d do it, right? Well, you’re in luck! Take a look at our recommendations for buying a home the smart way. If you’re in the process of saving for a down payment, you might be able to scrape together the remainder of the money by qualifying for one of the more than 2,200 down payment assistance programs offered nationwide. These programs provide home buyers with low-interest loans, grants, and tax credits. If you haven’t heard of down payment assistance before, you’re not alone. Many people don’t know about these programs or assume their loans are more difficult to get than they actually are. You’ll have to meet certain eligibility requirements in terms of income, occupation, or credit, but buyers who use down payment assistance programs save an average of $17,766 between upfront savings and lower monthly mortgage payments over the life of the loan. Visit Down Payment Resource, which offers information on programs, to find a program you could be eligible for. You can see what houses are currently for sale in your area using realtor.com®. To fully stay on top of brand-new listings in your preferred area, however, ask your real estate agent to set up an automated email through the local multiple listing service so that you’ll get pinged every time a new listing pops up that fits your needs. Tracking new listings in real time can give you an edge over other buyers, because you’ll be in position to schedule showings right away and potentially make an offer before another buyer even steps foot inside the house. Many home buyers overlook foreclosed and bank-owned properties often because they fear the condition of the home. That’s a valid concern, because foreclosed homes are frequently sold as is—which means the bank is not going to fix any problems (even if you uncover them during a home inspection). However, buying a home that’s in foreclosure has a couple of big advantages. It’s often worth the investment, given that foreclosed homes sell for an average 15% below the home’s actual value—and foreclosed homes often sell for less than asking price. 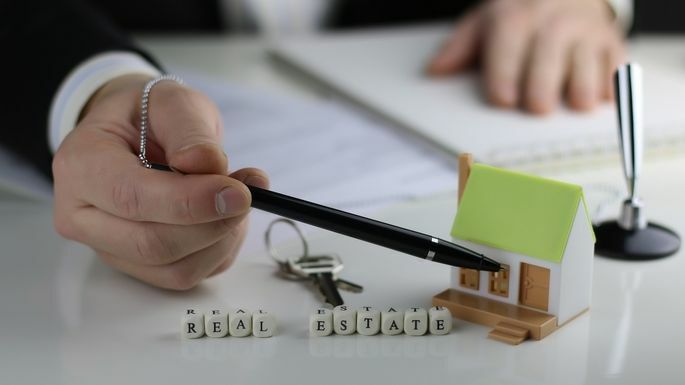 Also, because there is less competition among home buyers in this sector of the market, you’re less likely to go up against other bids when submitting an offer on a home that’s in foreclosure. Closing times are getting longer: On average, it now takes 50 days to reach closing, up from 40 days in 2015, according to a recent report by Ellie Mae, a company that provides mortgage solutions to consumers. To close faster, your best move is to get pre-approved for a home loan before submitting an offer on a property. A mortgage pre-approval entails a lender running a credit check and verifying your income and assets, followed by an underwriter doing a preliminary review of your financial portfolio. If everything checks out, the lender will issue you a written commitment for financing up to a certain loan amount that’s good for up to 90 to 120 days. Meanwhile, getting pre-qualified simply means you’ve discussed your finances with a lender and received a verbal commitment for the loan. Consequently, a pre-qualification can cause a home seller to dismiss your offer outright. And even if you somehow manage to sign a sales contract with only a pre-qualification, it’s probably going to take your lender longer to get the loan approved than if you had pre-approval. Daniel Bortz is a Realtor in Maryland, Virginia, and Washington, D.C., who has written for Money magazine, Entrepreneur magazine, CNNMoney, and more. Home staging—where you decorate your house in an effort to entice buyers to bite—may seem counterintuitive at first blush: Why spend money on a place if you’re moving out? Simple answer: because it can get you more money for your home sale. And evidence shows it’s usually well worth the effort. On average, staged homes sell 88% faster and for 20% more than nonstaged ones, which is nothing to sneeze at. But just how much does home staging really cost? Here’s the scoop, so you can decide if it’s worth the investment for you. File this one under “obvious”—but the pricier the home, the more it costs to stage. As a general rule of thumb, most stagers charge $300 to $600 for an initial design consultation, and $500 to $600 per month per room. “Therefore, a 2,000-square-foot home would cost around $2,000 to $2,400 a month,” explains real estate professional Crystal Leigh Hemphill. Most professional home stagers also require a three-month minimum contract, “even if you sell the home in 24 hours.” That could bring your final bill to $7,200. Most stagers work with the knickknacks and art that the homeowner already owns. 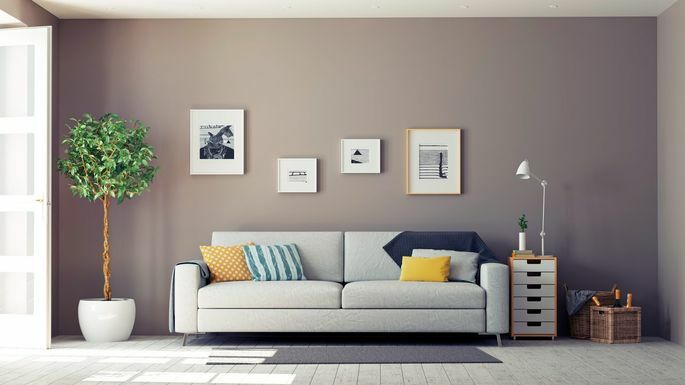 But sometimes they “need to purchase new accessories, fresh towels, flowers, and/or fruit, as these small touches make a big difference,” says Sheila Schostok with Your Home Matters Staging and Redesign. which serves Chicago and southeastern Wisconsin. And those new purchases will add to the overall cost of the project. The layout of your home could also add a ka-ching to a home stagin expert’s price tag. A job that requires heavy lifting in a multistory house usually means hiring additional help to move furniture, says Schostok. And if you’re listing a completely vacant home because you’ve already moved out, you’re looking at the additional expense of renting every stick of furniture and all decor items. Conversely, if you inherited a ton of antiques (or have a One King’s Lane addiction), you may need to put excess belongings into storage, tacking that monthly rental onto your overall staging costs. A final expense, an important one that can help ensure staging success, is the price of painting a room. A fresh coat in a 12-by-12 square foot room will cost a DIYer around $200, or $400 to $700 if left to the pros. The biggest savings? Selling your home faster, at a better price, and without months of carrying costs—because your house was properly staged and buyer-ready. Is It Worth It to ‘Stage’ Your Home When You Put It on the Market? It’s that time of the year again. Your home has to be properly heated in preparation for the low temperatures this season. Proper heating not only makes your home more comfortable to stay in during winter, it can also help you save on energy bills. 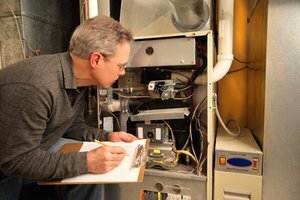 For this article however, we will focus on your water heater. A water heater is a simple device. It is not difficult to maintain and they usually last from seven to 15 years. However, even with proper maintenance, sooner or later, you will replace your water heater. If your water heater starts to leak or if it isn’t heating, you have to replace it fast. A domestic water heater may be tank­type or a tankless type, and can use either gas or electricity as its heat source. Typical domestic tank­type water heaters range from 30 to 50 gallons and they require floor space to be installed. Tankless units are rated in gallons per minute (GPM) and range from 2 to 10 GPM. They can be wall mounted and located in reduced spaces. In the very best of cases this installation may be suitable for the able DIY person, but home insurance or local codes may require a licensed or certified installer. In cases where issues can arise, it is best left to professionals to resolve on the spot. A fairly complete plumbing tool set will be required, perhaps including a torch. During winter, people come in and out of your home tracking in all types of debris — which can do a lot of damage to your hardwood floors. Snow and water in particular, can be absorbed by wood. Hardwood floors not only make your house look beautiful, it also adds warmth to your home interior. Wood floors become extremely cold during winter. However, when heating a home interior with hardwood floors, the increase in temperature should be balanced with a gradual decrease in humidity levels. Otherwise, you risk warping the wood. That being said, you need to refinish your hardwood floors before winter sets in as this will provide extra protection to your wood floors. Hardwood floors should be refinished regularly to extend its lifetime. The cost of refinishing hardwood floors varies greatly from region to region. This may be suitable for the able DIY person. Keeping your home warmer during winter entails high energy consumption. However, if you have energy­efficient windows you can reduce your energy consumption. When choosing the best windows for your home, there is no one­size­fits­all standard. But according to House­Energy, when it comes to choosing the best windows for cold climates, the most energy­efficient are double­glazed and triple­glazed windows. These windows have a very low U­factor and relatively high solar­gain (SHGC) coefficient. This type of window in vinyl frame would work best. Vinyl is inexpensive and does not need to be painted or stained. Casement windows also provide the best ventilation when opened. Casement windows extend to the exterior of the house and may obstruct walkways. The actual cost of installation will depend on material and finish grade, size, structural preparation, special needs and the current labor rate – when using an installer. These prices are for service in the immediate area of the provider. Taxes and permit fees are not included. During contractor inspection, the homeowner should be informed about the cost of any repairs needed as well as the cost of adapting the new window with the current opening. Local or national subsidy may be provided for energy efficiency improvements. ● This project is not highly suitable for DIY with precise carpentry and a critical closure deadline. ● Partial DIY of removal and disposal tasks are possible for the prepared DIY. ● The clothes dryer is used more often. Due to the reasons mentioned above, you need a more efficient electrical system during winter. Electric range circuits bring power to electrical equipment inside your home. These are subject to compliance codes and professional practices designed to reduce fire risk. The cost to install an average electric range circuit, electric outlet circuit or electric dryer circuit depends upon the power rating, circuit lengths, preparation and special requirements, and the current labor rate. ● IMPORTANT: Whenever you are going to work with electricity, you need to turn off the circuit breaker first. Double check, using a non­contact voltage tester to make certain that there is no current before you start working. ● This project is somewhat suitable for DIY with good electrical skills and tools. ● Electrical circuits and installations must comply with codes to reduce fire risk. Most home owners choose wood doors for its aesthetics. It provides a good blend of elegance and strength and they can be very affordable depending on the type and quality of wood. However, wood needs to be treated regularly with paint or varnish so that it will be protected from wind, rain and snow. Neglecting to do so would cause rotting. For most people, the most practical choice for the winter season would be a fiberglass or steel door. Fiberglass and Steel are energy­efficient and common low­maintenance choices for exterior door material. The cost of installing average exterior fiberglass and steel doors depends on the type of material and finish grade, size, structural preparation and special needs, and the current labor rate. During contractor inspection, the home owner should be informed about the cost of any repairs needed as well as the cost of adapting the new window with the current opening. A project involving more than two windows may earn the homeowner a unit price discount Local or national subsidy may be provided for energy efficiency improvements. ● This project may suitable for DIY with carpentry skills, unless of a critical deadline. Home improvement projects may be costly if you are not well­informed. If you want to make sure your money is spent wisely on your home improvement projects, without having to sacrifice quality, visit howmuch.net for more information. For owners planning on putting their homes up for sale in the spring, their lawnmower might be the last thing they're thinking about as winter approaches. But what they do now can influence whether their yard equipment works when it comes time to sell. Here are five tips from the Outdoor Power Equipment Institute, an international trade association representing power equipment, small engine, and utility vehicle manufacturers and suppliers, that will ensure your clients are ready to jump in when spring comes roaring back. Always consult your owner’s manual for directions on how to properly winterize and store your equipment. If you can’t find your manual, check the manufacturer’s website. Disconnect the spark plug and battery cables before storing; you'll also want to do this before servicing or repairing equipment. Wear safety glasses and gloves to protect against harmful chemicals and debris. Drain the fuel. Stored equipment should not have fuel in its tank. Many fuels today contain ethanol, which absorbs water and may separate, causing operating problems. If there is fuel in the tank, remove what remains. You can do this by running the engine until it stops. Store leftover fuel properly. If you're planning on storing gasoline for more than 30 days, treat it with a fuel stabilizer. Use a sealed container that is approved for fuel storage. Always keep fuel out of the reach of children and animals, and away from heat sources or flames. Check and clean your equipment. Check for loose belts or missing or damaged guards. Tighten all screws and nuts. Remove any grass, leaves, or dirt that have accumulated on your equipment. Click on the link to view the current school supply list. 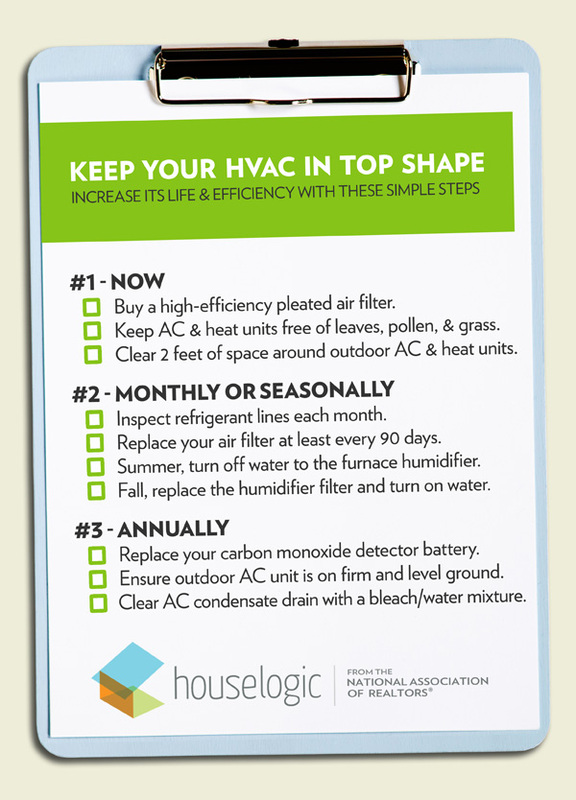 Here’s an easy, doable preventative maintenance checklist to keep your HVAC in top shape.